What does Abirami mean, details, origin, short & easy attributes? Meaning of Indian name: Abirami. 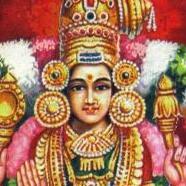 Meaning of the name Abirami is 'Godess Lakshmi'. Abirami is a name of Hindu / Indian origin, and is commonly used for females. Abirami is baby girl name mainly popular in Hindu religion and its main origin is Hindi. Abirami name meanings is Goddess Parvati, Goddess Lakshmi. People search this name as Abirami. Abirami is written in Hindi as अभिरामी. Other similar sounding names can be Abhiraam, Abhiram, Abhirami, Abhram, Abiram, Abram, Aprameya. Each letter meanings in Abirami Name. Popular personalities with Abirami Name. Other Personalities with Abirami Name.